Option 6: Put an engineer there, in case the engine loses a spark plug. I am fully aware that you can put fuel tanks there, my point was that it's a big empty space that is excellent for ammunition storage. I see your point, although I still don't know about a place where "if you get penetrated, your ammo goes up" being an excellent location for that. It is as excellent as the Challenger II's ammunition storage. Space efficient but very deadly for the crew. Actually, as a ex-Leo 2A6 crew member and current TNO researcher told me, he thinks it's the biggest flaw of the Leo 2 design. He also went as far as claim that the lower plate isn't actually all that thick. Which, combined with the ammo stowage behind the lower plate makes me raise an eyebrow. It is possible to extend the ammunition rack to the whole width of the bustle? Removing the pumps and old FCS should clear up space. 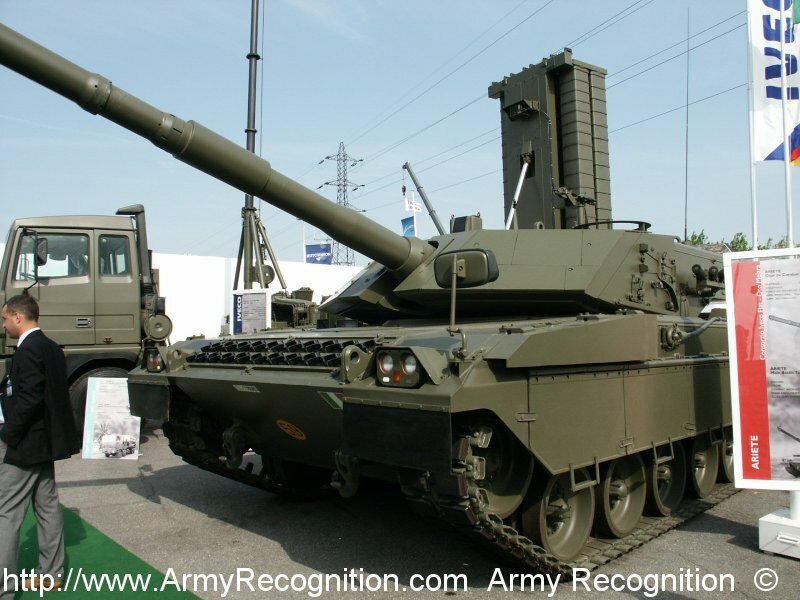 Alternative you could add a auto loader like the Leclercs if you need it for the 130mm gun. Or move more ammunition to the turret. Would this be too expensive? The hull rack could be made into a armored wet storage rack, with fuel tanks on the side for added protection. But I have a feeling they would simply leave it as it is for increased ammunition capacity. I don't know Xoon_ZG, there are tanks that don't place their ammo up front and their general size is similar. And no, I'm not talking about a Merkava with a radically different design philosophy. It would take a really big or specialized mine. Those do exist, but the 20-40mm of belly armor most MBTs have makes them a hell of a lot harder to kill with mines than, say, trucks or APCs. To put it in perspective, most MBTs have about two to three times as much belly armor as a LAV-25 has over the frontal arc. IEDs are not really a problem for LFP. Generally only EFP mines can be real danger, but they are usually placed in such way that only side armor is in real danger. And ALL Western tanks are needlessly big comapred to MUH SOVIET MEDIUM TANKS like T-64. Yes, medium, because i am now fully into "USSR never had MBT from 1960s to 1990s" theory. Does anyone have ground clearance figures for the T-72? I had always heard that it's about two inches less than for Western MBTs. According to Steven Zaloga, the T-72 has 490 mm ground clearance; this about the same as the M1 Abrams (19 inches/482 mm according to Hunnicutt), but about two inches less than the frontal area of the Leopard 2 (550 mm). Also curious if anyone has figures showing the approximate thickness of the armor in the front hull of the Leo 2. The upper section of the Leopard 2's hull nose (the one sloped at ~45°) has a line-of-sight thickness of more than 600 milimetres. The distance to the end of the special armor cavity is 600 mm, behind this is a further steel plate; I have commonly seen estimations in the range of 640-660 mm. This is essentially the same thickness as the armor cavity with backplate on the Abrams (estimated to be 600-700 mm). Also one should note that this is the same thickness as the M1A1 Abrams and Leopard 2A4 turret when attacked from 30° angle. The composite armor at the lower nose section gets thinner; to some 200-300 mm-ish thickness until it ends. Something like this photo from SteelBeasts shows, but the lower armor cavity slopes back and is no straight. However the Leopard 2 has further armor packages for the hull available, such as IBD's MEXAS-H design (as adopted on Strv 122, Leopardo 2E, Leopard 2HEL, Leopard 2A5DK and Leopard 2A7 QAT), RUAG's SidePro armor aswell as the AMAP armor (as operational with Singapore and Indonesia). 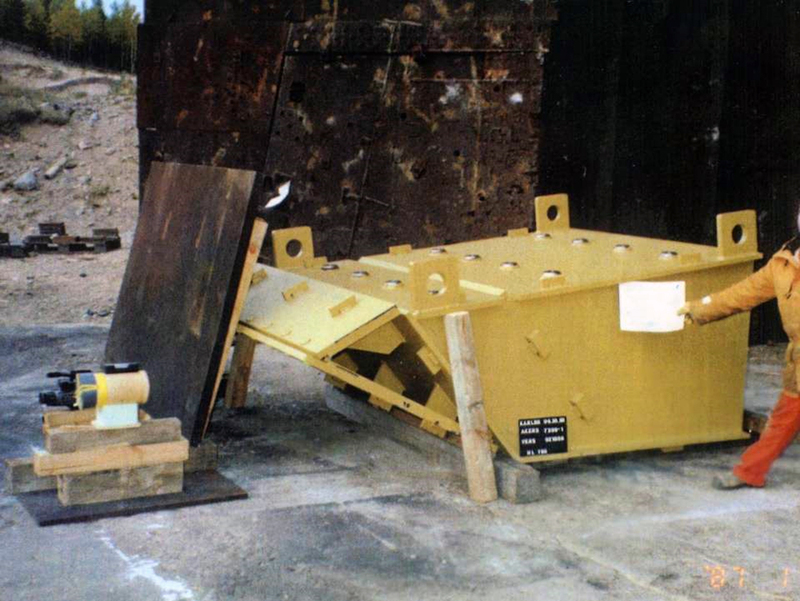 This armor packages add at least one foot thickness of composite armor to the tank. 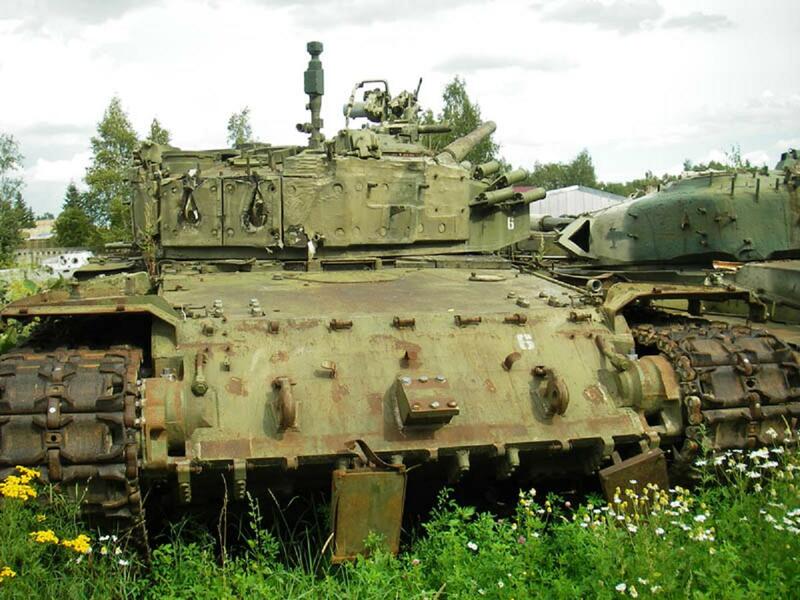 When the adoption of this armor package was tested on the M1A2 and Leclerc tanks for Sweden, the Swedish FMV noted a 50-100% increase in protection according to FMV's Richard Lindström. In Germany the armor package was originally ordered in 1995 for adoption within the KWS 3 upgrade (whole hull would require an overhaul for KWS 3, as this meant the adoption of a new turret with 140 mm gun), but the order was canceled shortly after. Currently Germany is trying to enhance the Leopard 2A7 design (enhanced tank currently codenamed Leopard 2A7V), which also includes the adoption of the further armor package. Frontal hull vulnerability, at first glance, looks like one area where the Abrams is greatly superior to the Leo 2. The left side of the Leo 2 hull is filled up with non-compartmentalized ammo and the right side of the Leo 2 hull is filled up with driver. On the Abrams the driver is centerline, and the right and left are filled with fuel tanks. If you are talking about crew survivability, the frontal fuel tanks of the Abrams might be an advantage. On the other hand, once the fuel tanks are hit and the fuel is incinerated, the tank has be abandoned unless you want to eat fried Abrams tankers. The fuel tanks of the Abrams are more likely to be incinerated, because of the thinner side armor compared to the Leopard 2. The Leclerc might have the best hull armor design (at least as long as there is no AMAP/MEXAS-H armor), but it's lower front is not protected by composite armor. I always thought it was an odd decision to put the ammo at the front. It is the safest place. All current tanks are optimized for anti-tank warfare, which means the armor of the tank is designed to protect the frontal 60° arc of the vehicle. By placing the ammo directly behind the hull armor, the largest amount of the frontal 60° arc of the the ammo is protected by the tank's thick frontal armor. 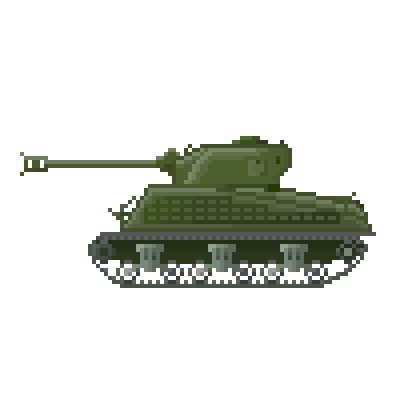 Moving the ammunition away from the armor, means it is more exposed, as less of it is covered by the tank's frontal armor. It is possible to extend the ammo rack to the whole width of the bustle; Rheinmetall once proposed to fit a semi-automatic loader at the bustle containing all ammunition. However storing all ammunition in one place is not an ideal design decision, because this means you have to put enough armor at this place to survive anti-tank weapons; otherwise your ammo rack will be hit and the tank is useless. This is why the M1 Abrams' bustle has the same armor protection as the crew compartment. The 130 mm gun will need an autoloader. 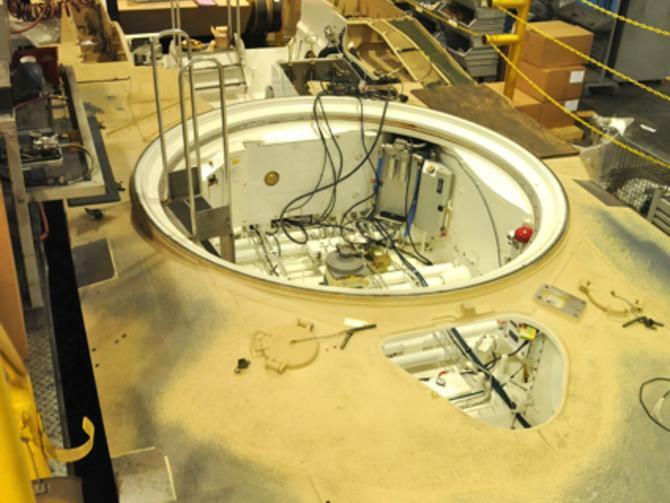 Rheinmetall claims that their Leopard 2 Revolution tank has a new "decoupled ammunition bunker". I am not sure if this also has a blow-out compartment or is just a fancy new term for ammo rack. Now it's Ariete bashing time. The Italian engineers had no knowledge of manufacturing proper tanks (even the OF-40 export tank was largley based on Leopard 1 components; in fact the original hull design was made by German companies), so the Ariete is a bit special. It's turret has extremely thin side armor, some say it's spaced armor, other people claim it's normal steel armor or composite. Judged by the thickness of the ammunition hatch, it's side armor might be 100-150 mm thick. Looks kind of like the Leopard 1A3's ammunition hatch. The hull side armor however is more than average, because it extends along the whole hull sides (whereas tanks like the Leopard 2 and Abrams have thin armor at the engine compartment). This might be ~60 mm armor at the engine compartment vs the Leopard 2's 40 mm and Abrams' 38 mm. Btw. did I forget to mention, that the ammunition in the Ariete's turret is stored like in the M48 tank? There are armor upgrades; a PSO package used in Iraq and a frontal turret armor upgrade, which apparently hasn't been purchased yet. Furthermore, a JP-8 fire can be extinguished (say, by the automatic halon fire suppression system that every Abrams has), unlike an ammunition fire, which categorically cannot be put out once it gets going. Except that turret armor is thicker than hull armor. By that logic, putting the ammunition directly behind the turret cheeks would be the safest possible location. You can see that the crew compartment is wider that the ammunition storage. I disagree. While true that it is protected by the frontal armor, would it not be also true that a center-placed ammo rack is also protected by the frontal armor? The difference here is that a penetrating shot has more distance to travel until it can hit the ammo, meaning it will have a far lower chance of actually being hit by high speed fragments as it will be saved by modules between it and the armor. However, not the case in the Leopard. That is, if it's taking hits from the front. If it takes hits to the sides or to the belly (IED/mines), then ammo placement doesn't matter because with any design, it would be just as easy to hit. Tank armor doesn't completely prevent a modern KEP's penetration. It just determines how much range has to be between the tanks until a penetrating shot can be scored. With Russia's new 1-piece ammo and improved 125mm gun, I'm pretty sure a T-14 can penetrate the hull front of a Leopard 2 at decent range. And since we can never actually guarantee a certain place in the tank will be completely impregnable to all threats, it's important to design a fail-safe solution. This is exactly why I am critical of the T-14's design (crew located at frontal section). Although it was a compromise due to the general design, it's still a flaw. However, for both points I do admit that for any tank, a hull down position is an ideal situation and thus protection features should be focused on the turret. All the ammunition rack have blow out panels and are armored. The auto loader is a Leclerc style bustle auto loader. The fuel in the sponsons are optional, when the front cant fit more fuel, it is stored in the sponsons. Side exhausts to avoid spewing smoke in the face of the infantry. Is that a driver-in-turret config, or is the driver buried in the hull along with the fuel? Instead of having an extremely sloped glacis that meets the turret ring, it has a somewhat less sloped glacis and a long flat section. This avoids the weak zone where the turret ring meets the glacis seen on... just about every current MBT, actually. It would reduce the driver's visibility, but with the wondrous cameras now available this could be less of a problem. 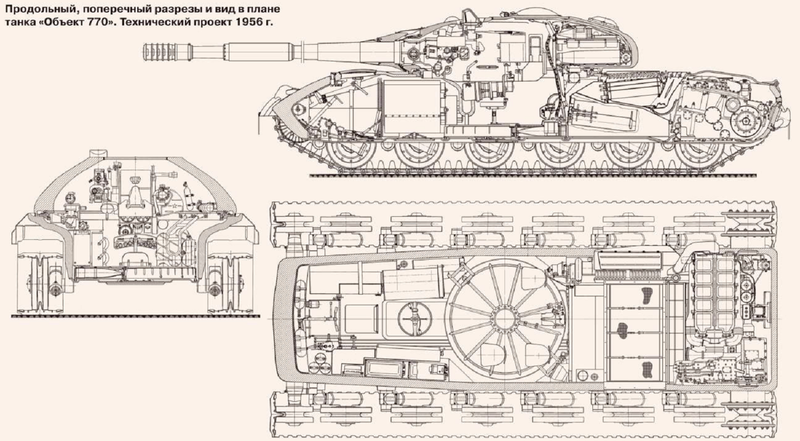 This is cross section of Object 490, so in 1980s designers were looking at such layout. As for the video of the burning T-80U; there are huge differences to our hypothetical scenario. First of all there are several hundred gallons of fuel in an Abrams (most of which is stored in the front), not just a tiny bit. 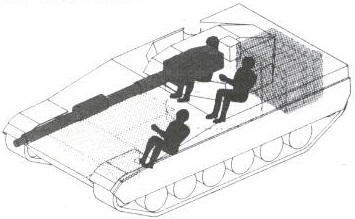 The fuel tanks are not insulated from the interior, there would be only a small amount of steel and foam between the fire and the crew, while the T-80U has about two feet of composite armor including non-metallic materials (with much lower thermal conductivity than the Abrams' fuel tanks). The automatic fire extinguishers might work in some cases, but they most likely not designed to extingusih the fire of the main fuel tanks. The amount of halon seems to be more limited. I don't know; actually I was talking about the fuel being on fire without the crew compartment being penetrated. Yes and no. The turret armor is not thicker, if you take a look along the complete 60° frontal arc. But even if it was, there still is another difference: the turret is more likely being hit (depending on source, up to 75% of all hits occur on the turret). Moving the ammo to a place with lower likelyhood of it being hit, is the first step to make the tank more survivable. There is absolutely no need to become huffy and feel insulted. Everything I said is either based on a direct source or can be measured. I have read about and seen (although not in person) many cases of vehicles starting to burn after the fuel tanks were penetrated. This is why I wrote about this previously. I don't think the Leopard 2's hull design is a genius idea and the very optimal design; however I also don't think it is horrible and (a lot) worse than the Abrams hull design. In the end every design decision on an armored vehicle is a trade-off between multiple different factors. While people online are always very eager to praise the Abrams hull design, there is one major issue about it that bogs me: nobody cared about using the same design. The Leopard 2, the Leclerc, the Challengers, the K1, the Type 90, the Ariete, GM's XM1 design, hell even the brand new built-from-blueprint tanks such as the Type 10, K2 Black Panther and Altay have the same "dumb ammo storage" as the Leopard 2. So I cannot believe that it is inherently bad. What is the likelyhood of the frontal armor being penetrated and the ammo being incinerated without the crew dieing? Is there enough time to leave the tank before the ammo completely explodes (after initially being set on fire) for the crew to leave? Maybe these questions play a major role in tank designing; I don't have answers to them, but the people who should have access to such data (the people responsible for designing tanks) choose the dumb Leopard 2's layout. I'd personally love to see the same ammo storage layout, but fitted with blow-off panels and a proper isolated compartment. Yeah, the idea was for the driver to be up front like in the M1, protected by the fuel. The further away from the front, the more exposed is the ammo. Traveling through more distance won't realistically affect the penetration power of an APFSDS/hollow charge jet or it's fragements. It will be enough to set the ammo on fire. An uncontrolled fire inside the hull, whether it's a big fuel tank or the ammo would require evacuation of the tank. There's just too much energy in that stuff; the heat in ammo cooking off is frequently enough to de-temper the torsion bars, which is why knocked-out tanks frequently sink into their own suspensions. 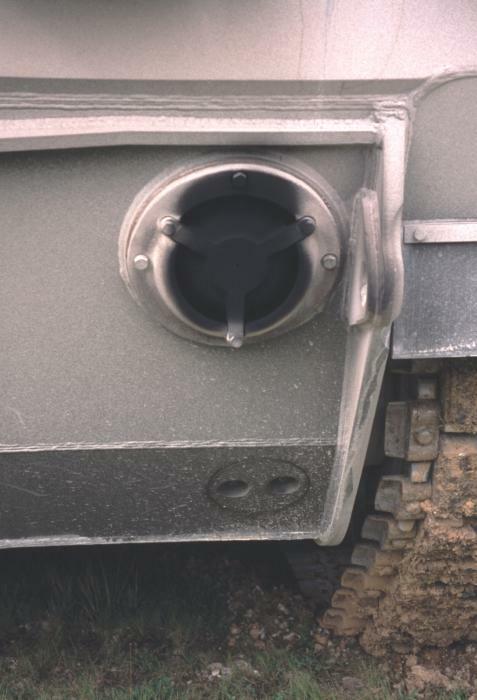 AFAIK the Abrams' fuel cells are just big, dumb fuel containers, but upgraded fuel tanks are a part of the M1A3 program. Whereas ammo, once it gets going, effectively cannot be extinguished. 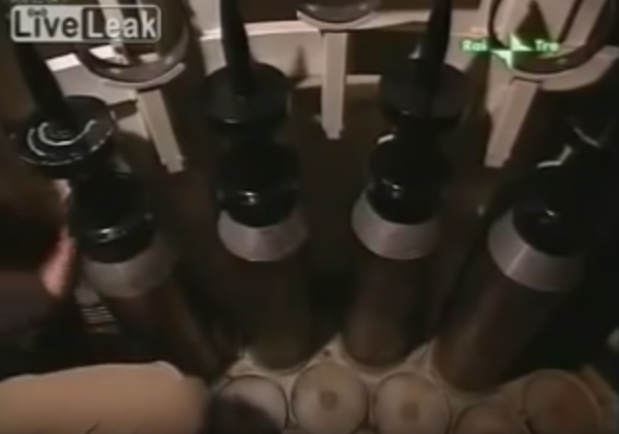 So wherever you end up putting the ammo, it had better be isolated and under blowoff panels. But to put out a fuel tank fire, one need only deprive it of oxygen. There only needs to be enough halon to displace the oxygen entering the burning fuel tank to get the fire to go out. When you penetrate a fuel tank, there are two holes from which oxygen can enter. One at the interior of the MBT, one at the place where the penetrator originally impacted. I am no expert for halon gases, but it seems somewhat unlikely that it is capable of exiting the tank through the penetration hole and is capable of completely blocking all air of entering. While Halon has a lower density than air, there still is Fick's law... this topic might need further research. According to Israel Tal, fuel was found to be about 1/7 as efficient against HEAT as steel of the same thickness. This matches the expectations of the density law. ME of 3 is straight out of Ogorkiewicz. But even 1/7 TE for something that weighs less than an eighth of what steel does is quite acceptable for something that is going to be on the tank anyway. For diesel however it's different because that has a secondary effect where the diesel implodes onto the penetrating hydrodynamic jet, slowing it down and thus decreasing jet velocity. This effect does not happen in solids.